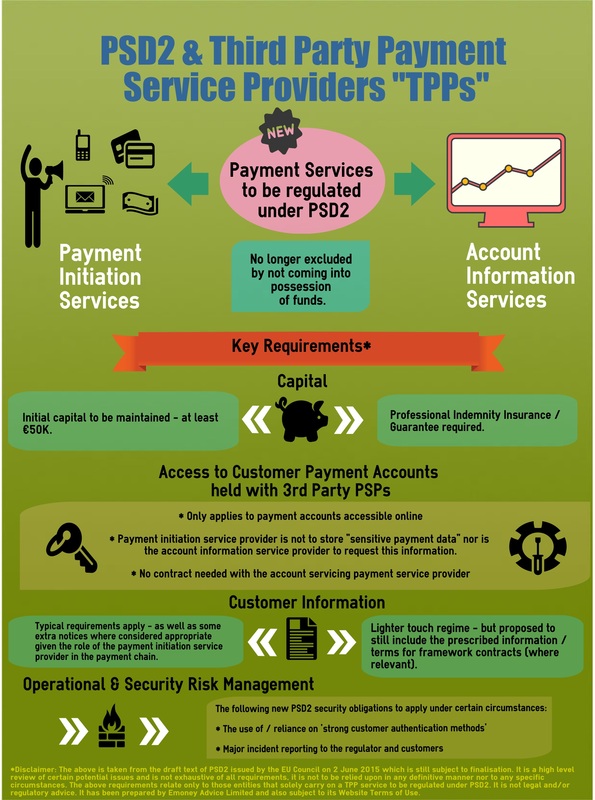 The following infographic highlights some of the key requirements that the ‘soon to be finalised’ PSD2 proposes to place on providers of “payment initiation services” and “account information services” (collectively referred to as “TPPs”). PSD2 looks to bring these service providers substantially within the scope of EU fintech / payment regulations for the first time. It is not only TPPs that need to pay close attention to the new rules expected under PSD2. Of particular interest to existing PSPs will be the access rights that TPPs will have with online account servicing payment service providers as well as the obligations on such parties to permit TPPs to carry out their services. This and more information on the proposed PSD2 can be found by clicking here. advisor, mobile pay, payment, payment services directive, Payments, PSD, PSD2 permalink.